This book was released in February in print and eBook and is now available in an audiobook. This, in my opinion is a fantastic book – see my review as evidence. 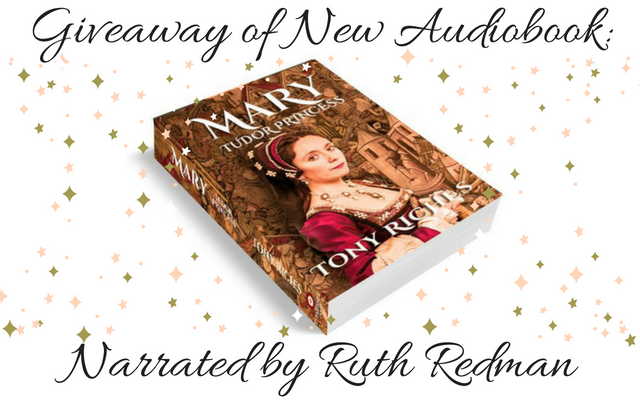 Book Review: Mary Tudor by Tony Riches. This is your chance to win one of five audiobooks that the author was kind enough to offer for this giveaway. Mary Tudor watches her elder brother become King of England and wonders what the future holds for her. Born into great privilege, Mary has beauty and intelligence beyond her years and is the most marriageable princess in Europe. Henry plans to use her marriage to build a powerful alliance against his enemies. Will she dare risk his anger by marrying for love? Meticulously researched and based on actual events, this ‘sequel’ follows Mary’s story from book three of the Tudor Trilogy and is set during the reign of King Henry VIII. 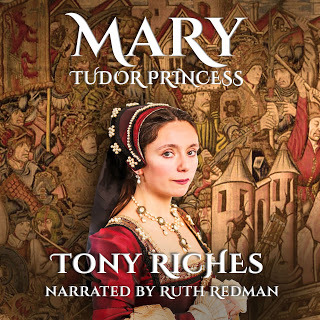 Actress Ruth Redman’s wonderful narration brings Mary Tudor to life with compelling warmth and sensitivity. Step #1 – In the comments below, answer this question: What year did Mary go to France to wed King Louis XII? Step #2 – Go back to my Facebook page (where you just clicked on the link or image) and tell me why you’d love this audiobook in the comment thread of the post. Winners will be announced on Monday. I saw you gave me a review, which is fantastic (thank you), but I need you to comment on the Facebook post to be included. It’s too hard for me to keep track otherwise. Mary Tudor left for France to wed King Louis the XII on 2 October 1514. I had input my first name, Mary, and didn’t notice the post had inserted automatically as Tudor. So I reposted with my correct last name, Thomas, which shows a second entry. And I’m thinking this will make a 3rd post. Grr, I should definitely stick with audio books since my typing is horrendous. Awhile ago I was very interested in the Elizabethan Era. After graduation I lost some of my enthusiasm for it. However, now that I have retired i would like to get involved in it again. Darn! I’ll take this the opportunity to have a giveaway copy of Mary – Tudor Princess. Everything is done. Should I share this with my friends too? I’m excited about the result.